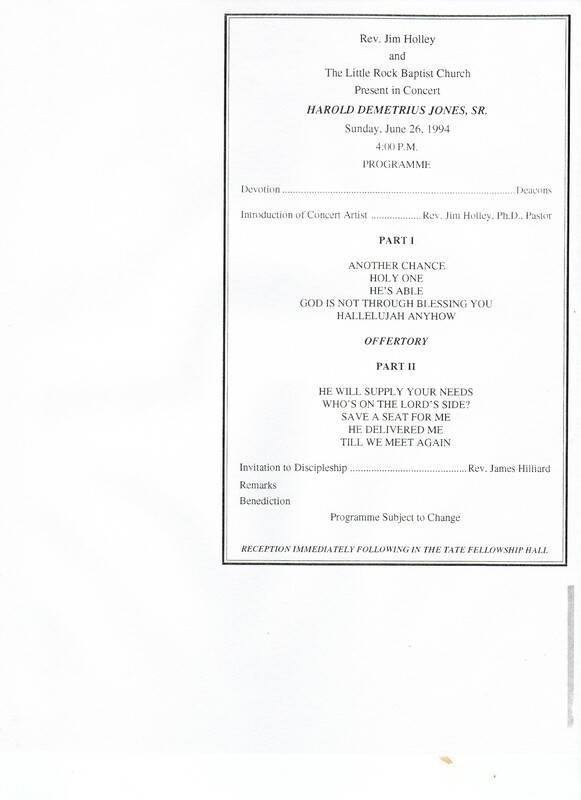 Description: Little Rock Baptist Church presents in concert Harold Demetrius Jones. 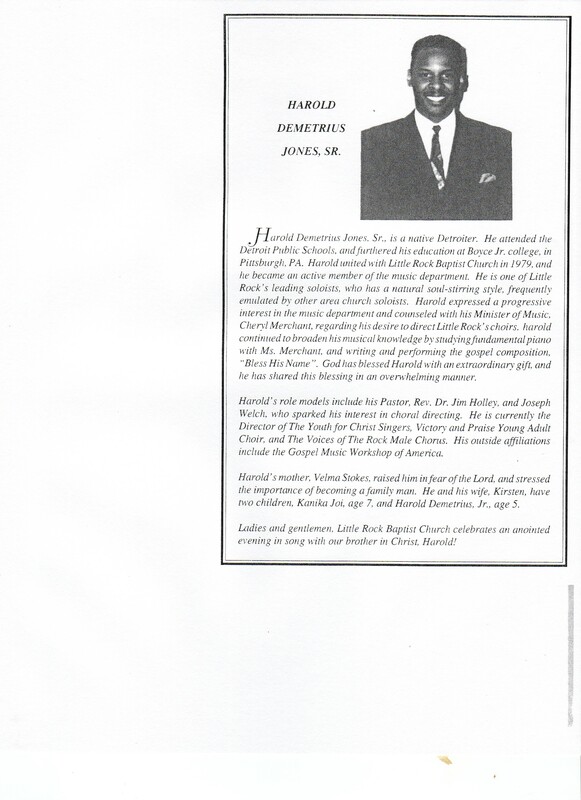 Transcript: Harold Demetrius Jones, Sr., is a native Detroiter. He attended the Detroit Public Schools, and furthered his education at Boyce Jr. College, in Pittsburgh, PA. Harold united with Little Rock Baptist Church in 1979, and he became an active member of the music department. He is one of Little Rock's leading soloists, who has a natural soul-stirring style, frequently emulated by other area church soloists. Harold expressed a progressive interest in the music department and counseled with his Minister of Music, Cheryl Merchant, regarding his desire to direct Little Rock's choirs. Harold continued to broaden his musical knowledge by studying fundamental piano with Ms. Merchant, and writing and performing the gospel composition, "Bless His Name". God has blessed Harold with an extraordinary gift and he has shared this blessing in an overwhelming manner. Harold's role models include his Pastor, Rev. Dr. Jim Holley, and Joseph Welch, who sparked his interest in choral directing. He is currently the Director of The Youth for Christ Singers, Victory and Praise Young Adult Choir, and The Voices of The Rock Male Chorus. His outside affiliations include the Gospel Music Workshop of America. Harold's mother, Velma Stokes, raised his in fear of the Lord, and stressed the importance of becoming a family man. He and his wife, Kirsten, have two children, Kamika Joi, age 7, and Harold Demetrius, Jr. age 5. Ladies and gentlemen, Little Rock Baptist Church celebrates an anointed evening in song with our brother in Christ, Harold!